The Shapoorji Pallonji Group, one of India’s trusted and oldest real estate brands announced today the launch of its easy-to-own homes under the brand – Joyville in Mumbai with its first project in Virar. 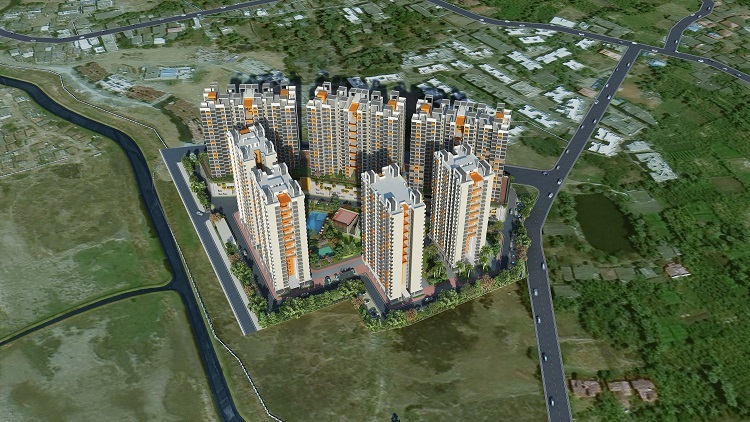 This is the second project under Joyville brand the first being in Kolkata launched early last year. Joyville, Virar will feature over 1200 residences of different configurations spread across more than 7 acres. The spacious and aspirational products come in configurations ranging from 1 BHK to 3 BHK. The customers can avail of flexible payment plans offered by the developer for the first few customers. Additionally the eligible customers can also avail the PMAY benefit to the extent of Rs. 2.67 lacs under the CLSS scheme. The project is coming up at a prime location in Virar making it not only an ideal address for buyers but also extremely affordable with close proximity to various social infrastructure like railway station, schools, malls, hospitals etc. The proposed state of the art Sports Complex and Athletics facility and the proposed Vasai Virar Municipal Corporation complex would be also very near this project. Apart from the spacious residences in a gated community, the project boasts of cutting edge amenities like clubhouse with swimming pool & gym, jogging and cycling tracks, sports-facilities for kids, recreation areas, parks & open spaces, banquet facilities to name a few. Sprawled across 7.3 acres, Joyville Virar will be one of the tallest towers in Virar, and one of the only development with a three-level podium. The completed project will offer over 1256 residential units comprising of 1 BHK, 2 BHK and 3 BHK that will range from MahaRERA carpet areas of 38.06 sqm (1bhk) to 66.52 Sqm (3 bhk). To facilitate easy the customers, residents will be provided with exclusive bus facility and 24/7 power back up in common areas in addition to the fundamental facilities. Also the project boasts of dedicated water connection line from VVCMC. Joville endeavours to be the gold standard for the mid-segment housing segment in India, through homes that empower the customer with the best of everything and offer the maximum value per square foot. At Joyville, we build homes that empower aspirational Indian buyers to step up towards their dreams. Our resourceful thinking, innovative mindset, value-driven approach and unparalleled experience garnered over 150 years enable us to maximize the value that we create for our customers at every step of the way. True to our roots, we inspire trust by adhering to uncompromisingly high standards in everything that we do, from the quality of construction, to the level of customer service, to the array of building amenities, and beyond. For our customers, this translates into peace of mind, genuine happiness and a deep sense of fulfilment. After all, a home is a reflection of one’s desires and achievements – the badge of honour that one wears with pride and joy. The Shapoorji Pallonji Group is a major Indian multinational with a rich legacy of over 150 years engaged in delivery of projects in engineering & construction, real estate, infrastructure, oil & gas, power, minerals & metals as also in businesses like agriculture, consumer products, electro-mechanical and MEP services, water treatment, facades and interiors, engineering, textiles, business automation, shipping and logistics. Today, with over 60,000 employees across the group serving various key sectors of the economy and a group turnover of US $ 4.5 Billion, SP Group has evolved to become one of India’s most valuable private enterprises with a presence in more than 50 countries. The real estate division of the group has created several prestigious residential and commercial landmarks in India and is renowned for its quality construction, efficient design and wide range of amenities offered.